The Fulham All Stars retained their Shooting Star Chase crown with a 10-4 victory over their Celebrity counterparts on Saturday afternoon. A Barry Hayles hat-trick, along with strikes from Paul Peschisolido (2), Sean Davis, John Pantsil, Andrejs Stolcers, the Magic Mod and Alan Neilson earned victory for the home side in our annual charity match. 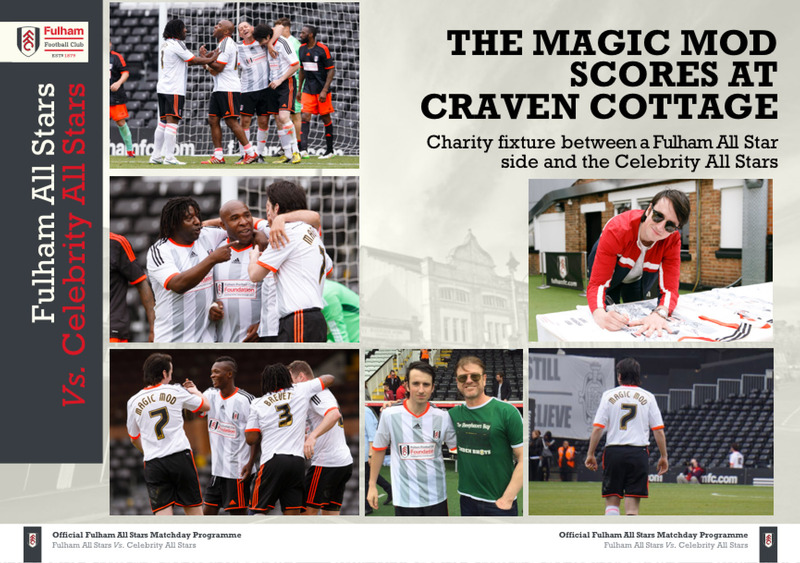 Fulham kicked things off and looked to take advantage of the lack of height in the celebrity goal, but Davis’ effort from the halfway line cleared Felipe, of Apprentice fame, and his crossbar. Hayles went close to breaking the deadlock with five minutes played when Peschisolido slipped him through, but his rifled effort found the side-netting. And the pair combined again for the opening goal two minutes later as a curling Peschisolido pass sent him in on goal and he rounded Felipe before nestling the ball in the net. Manager Simon Morgan suggested that it may go down as an own goal after a recovering defender got the final touch, but there’s no doubt Barry will claim it. Peschisolido then went from provider to scorer as he played a one-two with Davis before bending an effort inside the far post which Felipe couldn’t get a strong enough hand on to keep out. Hayles grabbed his second on 14 minutes when he spotted Felipe off his line and sent in a chip from 30 yards which sumptuously nestled in the back of the net, before Davis scored a similar effort five minutes later from outside the area after being teed up by Hayles. Kenny Achampong was known for bamboozling defenders in his playing days and he was at it again on 21 minutes when he beat his man before squaring across the face to Davis. He laid the ball off to Peschisolido who was never going to miss from close range. Fulham fan Ben Taylor, AKA Magic Mod, should have made it six shortly after but he was missing the magic touch when he connected with Achampong’s cut-back and skewed his shot over the bar. After conceding five goals inside the opening quarter of a game, Felipe made way to be replaced by Foundation Coach Chris Smith. Following a lull where nobody really had a chance, musician Tinchy Stryder almost pulled one back shortly before half-time, but again Maik Taylor was equal to the effort, with the Fulham keeper then making another great save to keep out captain Jack Whitehall’s rasping shot. They did pull one back before the break, though, as boxer Darren Barker converted from close range, meaning the score at the interval was just 5-1. Fulham emerged for the second 45 with vigour and Elvis Hammond almost got on the scoresheet when he cut inside and rifled in a low strike that came back off the post. But the sixth arrived soon after when Pantsil, having taken up a more attacking midfield position, nestled one inside the far corner. It was a neat finish which was greatly cheered by the fans in attendance. The Celebrities didn’t give up the fight, though, and grabbed another goal of their own shortly after the hour mark as DJ Spoony burst into the box and finished coolly beyond Maik Taylor. The five-goal advantage was restored not long after, however, as Pantsil slipped Andrejs Stolcers in and the Latvian smashed in a brilliant strike from a tight angle, although James Hill then notched another for the Celebrities. On 83 minutes Davis took a theatrical tumble in the box to win a penalty which The Magic Mod put straight down the middle for 9-3, but the Celebrities reduced the deficit again on 90 minutes when former Liverpool midfielder David Thompson tucked home the rebound following a Taylor save. But Fulham had the final say as defender Alan Neilson found himself well up the pitch and managed to chip the goalkeeper from a tight angle to ensure the game finished 10-4.